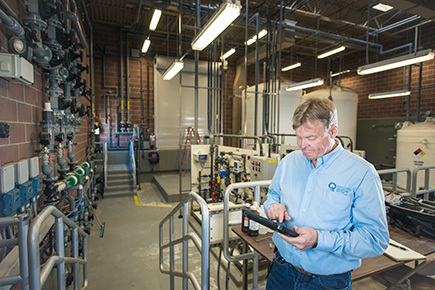 The development of a new source of water can be a challenging undertaking for a public water supplier or a consultant. There are a number of issues that must be addressed. To assure that a project unfolds smoothly, it is important that well drillers, consulting engineers, and groundwater consultants fully understand the review process. If a new source is introduced into a public drinking water system without necessary approvals, the water system will be immediately rated “Not Approved”. Will the water supplier be able to protect the source against present or future pollution sources? There are specific requirements for the location and protection of public drinking water sources. The first step in the process is to develop a Preliminary Evaluation Report (PER). The Division of Drinking Water must concur with a PER prior to the issuance of a plan approval letter. Within one year of PER approval, a Drinking Water Source Protection Plan (DWSP) must also be approved. For further information see Source Protection Program. Will the chemical and bacteriologic quality of the water meet drinking water standards, or can the water be treated to meet those standards? See Initial Chemical Sampling Requirements for a summary of what must be sampled for initially. If your new source is located within natural deposits of asbestos, then initial sampling for asbestos is required as well. See Drinking Water Standards (R309-200). See Minimum Treatment Requirements (R309-505) for treatment standards. Those developing new springs or wells should not automatically assume that the water obtained from these sources will be classified as groundwater. Springs and wells may yield water which has not been adequately filtered underground. These sources are referred to as ground water under the direct influence of surface water. If there are indications that a new source may be directly influenced by surface water, a Microscopic Particulate Analysis (MPA) will be required. See Protocol for Determining Ground Water Under the Direct Influence of Surface Water. Water from springs or wells determined to be surface water influenced must be appropriately treated. Will the quantity of water developed from the source be sufficient to meet anticipated needs? See Minimum Sizing Requirements (R309-510). Has a Project Notification Form been sent to the Division? Once a water supplier determines that a new source will be constructed, a Project Notification Form must be sent to the Division.The Project Notification Form can be submitted concurrently with the engineering plans and specifications for the project (see next Item below) or submitted online beforehand. Does the design of the source or treatment facilities meet the Facility Design and Operation Rules? Has a plan approval letter been issued by DDW prior to construction? After construction has been completed, has an Operating Permit been issued to allow the facility to be used? After construction is completed, a new facility may not be put into service until an Operating Permit is issued. An Operating Permit Checklist is available which describes the information which must be provided to DDW before a permit can be issued. After a source is put into operation, it must be periodically monitored for a number of different chemical substances (e.g., lead, arsenic, nitrates). Refer to Source Monitoring (R309-205). See also Construction Approval Process: Project Notification, Plan Approval, and Operating Permit.